Wishing all our the readers and contributors of the Roundwood notes a very happy Christmas & healthy 2018. Thank you to Margaret Bolger for helping out through the year & to all of you for keeping the news coming. Look forward to plenty more for 2018. Tickets go on sale for Beauty and the Beast tomorrow evening and they would make a great Christmas present. There will be a disco for children from 7pm – 9pm this Friday 22nd dec and Roamin Cadillacs will be playing in Fannings on Saturday 23rd December as part of our fundraising. Show dates are 26th 27th & 28th jan. Two evening shows and two matinees. The Roundwood Parish Hall committee and staff would like to wish all their customers and supporters a very merry Christmas and a happy and healthy new year. Thank you for your continuing support. 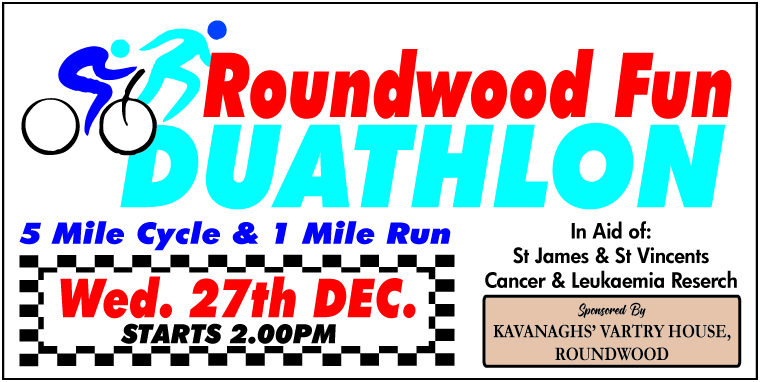 In association with the Roundwood & District Community Council, the Roundwood Fun Duathlon will take place on Wednesday 27th of December generously sponsored by Kavanagh’s Vartry House. This community event will provide a great opportunity for folk to shake off the Christmas cobwebs and test the new bikes that Santa brought while raising much needed funds for St Vincents & St James Cancer & Leukemia Research. The route will consist of a 5 mile cycle and a 1 mile run and take in some of the Vartry Reservoirs trails. For families and those of a less competitive nature, there is a shorter walk which will be entirely on footpaths or on the Vartry trails. An evening of great entertainment is planned afterwards in Kavanagh’s Vartry House. A fun afternoon for all the family is guaranteed. Registration from 1.30pm at Kavanagh’s with a race start time of 2pm. 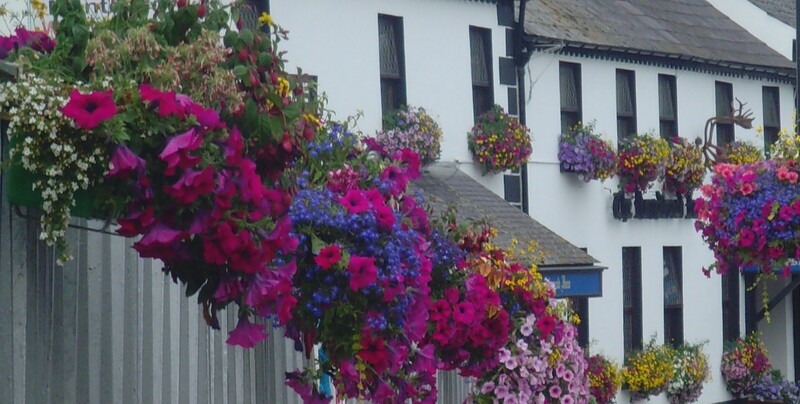 Moneystown Community Centre would like to wish all our patrons a Happy Christmas and a Peaceful New Year, also we would like to thank everyone for all their support throughout the year. Cards will continue as usual on Tuesday nights at 8 pm while our Moneystown Dance will return on Friday 9th March. Thank you. The members of the Shed are participating in a MARATHON and this is a marathon which is measured in years and not kilometers. Our most mature Shedder is on the go for over 80 years and the rest of us are not all that far behind. But we will never overtake him, although hopefully we will be able to clock up that mileage eventually. There are lots of stops along the way for hip and knee replacements, battery replacements for heart pacemakers, and dentures, spectacles and hearing aids are in regular need of attention. One of the problems though is that if we are ever tested for drugs we will all fail the test. Sure it’s the drugs which keep us going and for the most part these are supplied by the local pharmacy. We have a lovely couch with matching armchairs in the Shed but they are taking up too much room . So they are there for the taking. Talk to one of the Shedders or call 086 8650588 if you are interested. One of our Shedders is working on a Facebook page for the Roundwood Men’s Shed. So if you click in you may see some photographs which he has posted. Best wishes to all our Shedders and their families for Christmas and the New Year. Next whist will be on tonight Wednesday 20th December in the Parish Centre. This entry was posted in News & Events on December 18, 2017 by roundwoodiewicklow. Djouce Ladies held their end of year lunch and prize giving recently. The end of year prizes were awarded to Theresa Cowman Medals Final winner. The Eileen O’Connor Trophy went to Catherine Halligan. Golfer of the year went to Marian Molloy. Other prize winners were Kitty O’Neill, Ann Clarke, Nellie King, Una Fitzgerald, Margaret Donnelly, Pauline Pearson and Ann McGee. The incoming Lady Captain for 2018 Marian Molloy paid tribute to outgoing Lady Captain, Bernadette Campion on her outstanding year as Captain. A big thank you to the McGillicuddy family for keeping the course in wonderful condition all season. It was a great year in Djouce and anyone interested in playing golf will be very welcome at the club. Happy Christmas and New Year to one and all. Roundwood Home Producers Market would like to wish all our customers.a very happy Christmas and a peaceful New Year. We will be closing at 5pm on Sunday 17th December. We will re-open On Sunday 25th March 2018 Opening times are 12-5pm every Sunday. Nancy O Brien and Margaret Bolger played their cards right on Monday 27th November to take 1st place for North/South, 2nd Ger Lenihan and Paddy O Brien and 3rd Monica Brady and Gertie Fee. In 1st place for East/West were Catherine McGillycuddy and Bridie Nolan, 2nd Mary Pierce and Kay Plunkett and 3rd Teresa Leahy and Marian Davies. Monday 4th December saw Maura Gaskin and Kay Plunkett take 1st for North/South, 2nd Monica Brady and Nancy O Brien and 3rd Catherine McGillyuddy and Gaye McGettigan. 1st for East/West were Ger lenihan and Paddy OBrien, 2nd Rowena Brady and Judy Skates and 3rd Brid Clancy and Bridie Nolan. Next whist will be on Wednesday 20th December in the Parish Centre. This entry was posted in News & Events on December 11, 2017 by roundwoodiewicklow. This entry was posted in News & Events on December 6, 2017 by roundwoodiewicklow.